In this article, you’ll discover nine tools to help marketers save time while maintaining a human presence on social media. 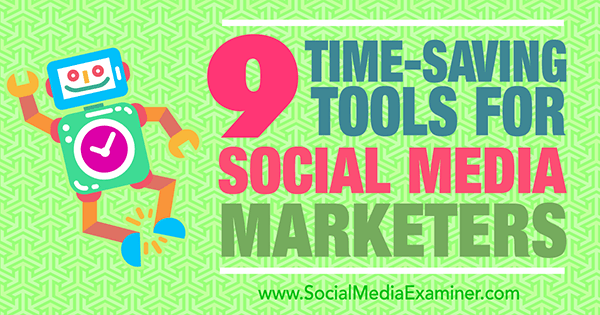 Discover nine tools to save time on social media marketing. Just like any relationship, connecting on social media starts with finding the right people and reaching out in a human way. Here are some automation tools to help you do that. Linking to other people’s amazing content not only helps establish your own authority, but is also one of the best ways to make meaningful connections. If you’re smart about leveraging those connections, you’ll reach out directly every time you include someone else in your own work. With Notifier, simply enter the URL into an article you’ve published (whether on your own site or as a guest contributor) and the tool will pull out all of the people mentioned in the post, tag them based on their Twitter handles, and queue up those shares via Buffer. Here’s what a recent article pulled in. Notifier pulls in mentions from your articles and connects them directly to each author’s Twitter profile. Notifier then lets you select how many mentions you want to include in each share and will schedule them to drip out over a chosen time frame. Notifier lets you use Buffer to schedule each post directly mentioning the authors you used. Visitors pass through your digital presence every day by browsing on your website, looking at your product or services pages, or maybe even consuming your content, all without submitting their information. This means that most of the time you have no digital record that those visitors even exist (outside of raw Google Analytics traffic counts). Leadfeeder is especially valuable to B2B organizations, because it will connect your onsite Google Analytics with your visitors’ off-site social profiles so you can see who’s coming to your site, which company they’re from, and what they’re interested in. Once you’ve identified your visitors, you can easily assign visitors to a campaign, customize your automated responses based on what they’ve shown interest in, and then measure the results. 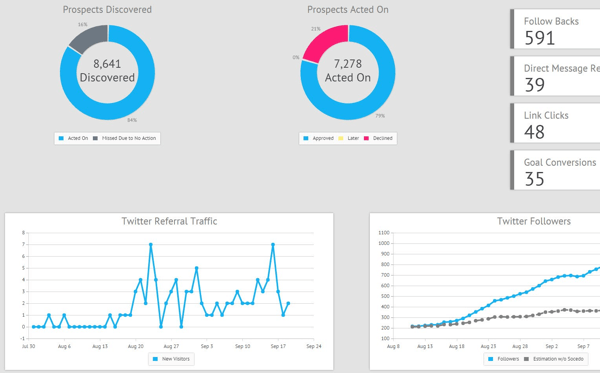 You can create targeted campaigns and monitor your social outreach within Leadfeeder itself. Many marketers overlook the bottom-line benefits of lead generation on social media because they haven’t found the right tool to automate prospecting and report key metrics like testing. Similar to Leadfeeder, Socedo is another great tool that helps you zero in on your ideal prospects via Twitter and LinkedIn, so you can collect their profile information and add them to your sales pipeline and CRM. Socedo helps you identify new prospects and leads automatically across your social media networks. Most notably, Socedo’s analytics provide robust reporting that links directly to platforms like HubSpot. This allows you to see exactly how specific campaigns have paid off, both on engagement and ultimate conversions. 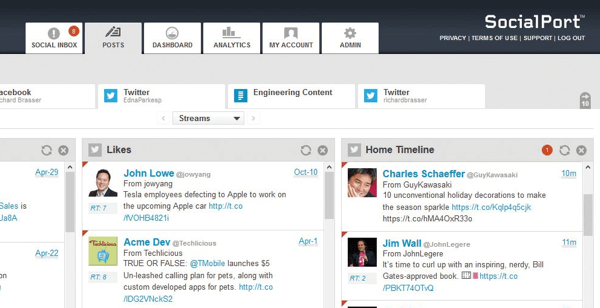 Socedo’s deep analytics make monitoring and optimizing your social connection easy and bottom-line-driven. Having a system in place that treats social leads differently from more heavy-handed email campaigns is vital, especially if you want to stay human. When it comes to advertising, selling, and customer service on social, things get even more inhuman than merely connecting with new leads. Here are three tools that strike an excellent balance among making the sale, supporting current customers, and being genuinely social. User-generated marketing in the form of reviews and recommendations is one of the most powerful purchase drivers online. While many websites feature reviews and testimonials, they drop the ball when it comes to sharing those same golden nuggets natively on social media. Enter Yotpo. Yotpo will incentivize reviews by offering bonuses or coupons to your existing customers. It will collect your reviews in a centralized database for easy access and allow you to instantly “push” your reviews both to your website and your social streams. Take Nest Bedding, for instance. 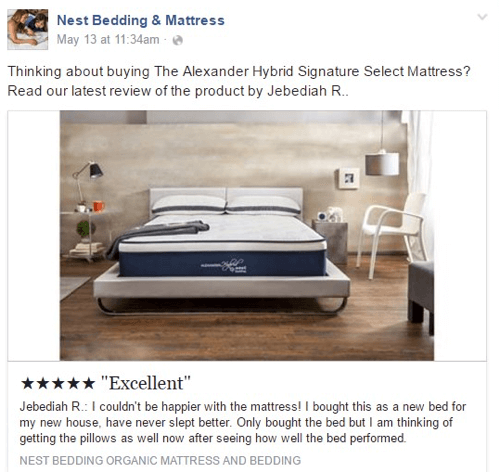 Using Yotpo, Nest Bedding was able to integrate user-generated content into a host of their social selling platforms, most notably Facebook. Yotpo’s user-generated content platform integrates customer reviews and ratings directly into your social media streams and advertisements. rFactr’s SocialPort tool is one of the few social selling tools designed to include a scalable training program for sales representatives operating on social media. It boasts an impressive lineup of clients including SAP, Microsoft, Intuit, and IBM. rFactr focuses on creating social-specific content, as well as tracking and optimizing that content. 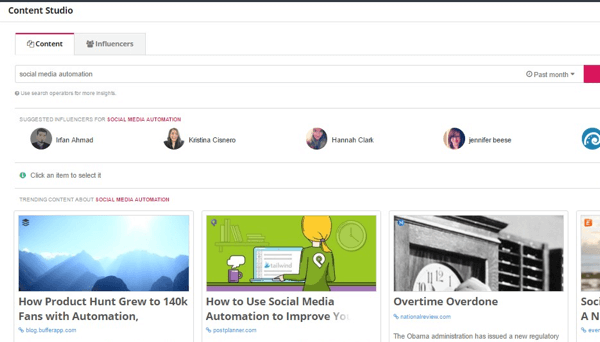 Even better, instead of adopting a one-size-fits-all approach, SocialPort will connect automated leads with actual humans within your company. You can then monitor these interactions to ensure quality and brand consistency according to each user’s skill set or role. rFactr’s SocialPort doesn’t just automate social selling, it connects leads to actual humans within your sales team. Finally, rFactr’s social intelligence analytics board lets you view and analyze all of the results brought in across your social media channels. Automating the commerce side of your social media shouldn’t end with attracting new customers. Instead, make customer service and retention a top priority. On the customer complaints front, timeliness is paramount. According to The Social Habit, 32% of customers who reach out via social expect a response within 30 minutes and 42% expect a response within 60 minutes. As for the wider scope of building and maintaining relationships, rather than relegate key customer-service touch points like order confirmation and tracking to email, you can now communicate directly with customers via their social platforms. Shopify’s Facebook integration, for example, lets you engage in genuine conversations with your customers. Shopify makes it easy to engage in real conversions with your customers on Facebook. Once you’ve gathered a killer following, you need to continue to share relevant, valuable, and engaging content with those followers. Realistically, keeping your social accounts topped off with shareworthy content is often a full-time job. These three tools, however, can help immensely. Unlike other automated posting tools, Quuu will create handcrafted and human-approved social media posts. 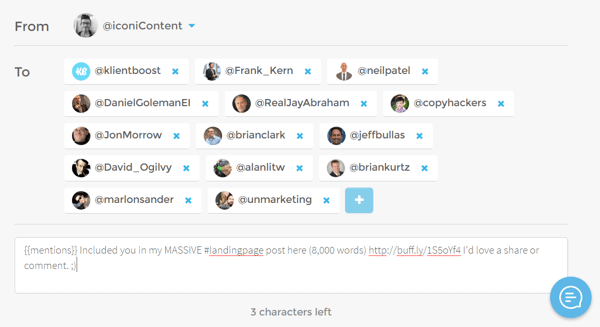 Simply hook up the tool to your Buffer account and then choose topics you want to tweet about. With Quuu, you can select from a host of topics that interest your audience the most on social media. You can then decide if you want Quuu to start posting automatically, or if you would rather preview suggested posts via email. 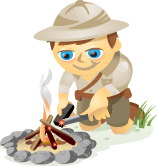 Similar to Quuu, Crate is another tool that suggests content. It too works in conjunction with Buffer. Unlike Quuu, though, Crate gives you more direct control over what you post. You get precrafted curated tweets to fill your content pipeline. You start by building “crates” based on combining topical categories like marketing or CRO, websites, and/or Twitter accounts. To get even more specific about the kind of content you want, add hashtags and positive and negative keywords. Crate then creates a large stream that sorts through it all and gives you posts to share, which you can then drop into Buffer. Once you’ve built your crates, you can then share or Buffer the posts that best align with what your social audience wants. To start, ClearVoice is far more than a content curation platform. With its paid side, you get access to a full-scale workflow-management suite plus content creation and distribution tools. However, you can search the content library for free if all you’re looking for is help identifying shareworthy content to fill your social queue. ClearVoice’s Content Studio is a free curation platform driven by both analytics and real human recommendations. 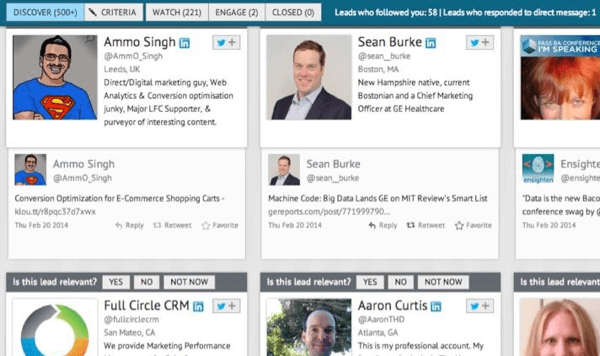 You can sort ClearVoice’s results based either on content or influencers. Naturally, ClearVoice isn’t a set-it-and-forget-it tool like Quuu, but it does radically simplify content gathering and leads you directly to the best “what” and “who” to share. It’s true, social media automation is a love/hate thing. The downside is obvious. More often than not, social media automation robs your social media effort of the very thing it needs most: humanity. The good news is that investing in the right tools, whether your focus is connection, commerce, or content, can save you from coming off as slimy, aggressive, and inhuman. What do you think? Do you have your own social media automation horror story to share? Or better yet, a favorite tool? Please share your thoughts in the comments below! 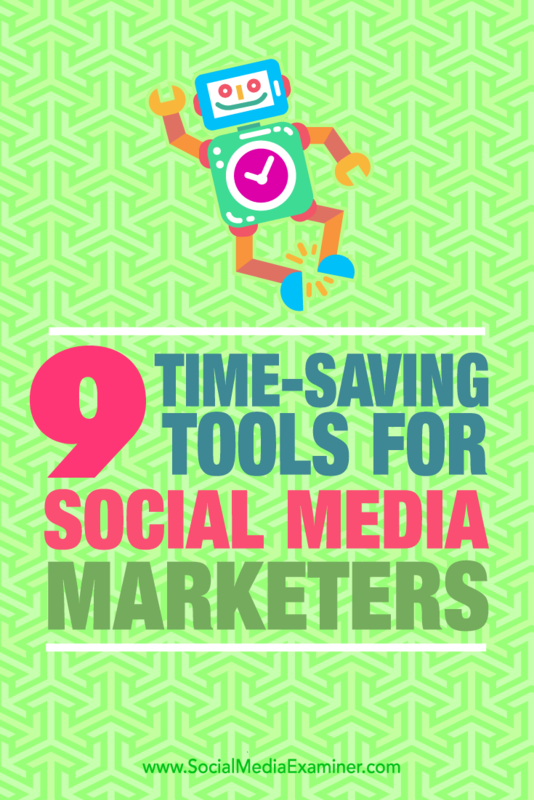 Tips on nine tools social media marketers can use to save time. Aaron Orendorff is a regular contributor to Entrepreneur, Fast Company, Business Insider, Content Marketing Institute, Copyblogger and Unbounce. Grab his Ultimate Content Creation Checklist at iconiContent.com.